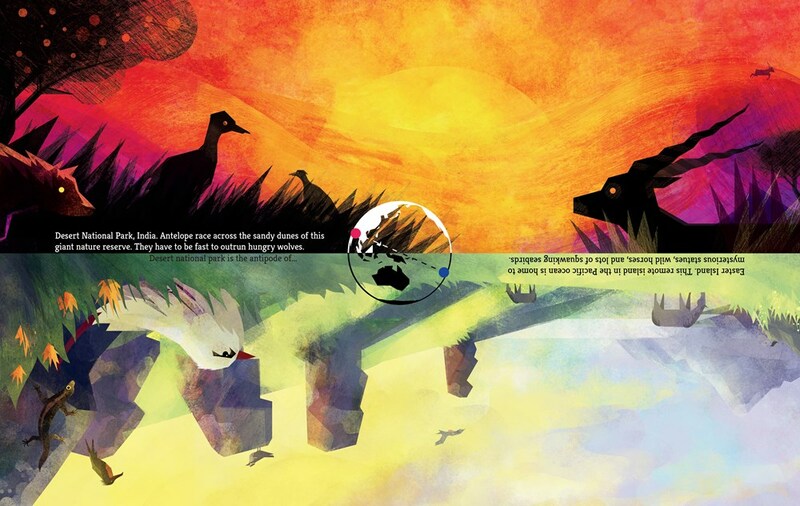 Animal Antipodes: Global Opposites by Carly Allen-Fletcher answers the question: if you dig a hole straight through the core of the Earth to the opposite side, what would you see? Antipodes are opposite points on Earth, and this book features them through the lens of the animals that live there. Each spread features a new set of antipodes, and readers must flip the book upside down to read what's on the other side, so we go from the North Pole to the South Pole in one spread, Desert National Park in India to Easter Island on another, and so on. Every location comes with a sentence or two about the animals that live there, and there's a tiny map of Earth in the middle of each spread to help readers remain oriented. The illustrations are as colorful as they are informative. They feature neon colors and geometric shapes to a point where learning the facts on the page feels organic and fun. 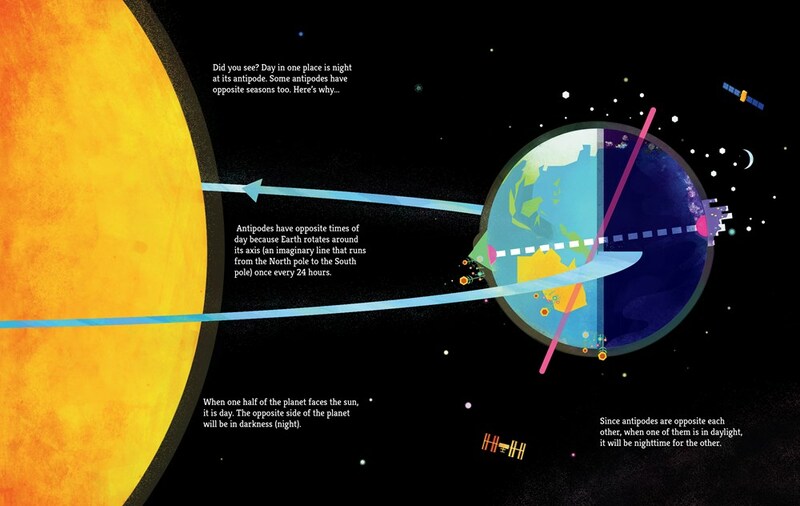 In addition to all the spreads of antipodes there are a few spreads that talk about things like why the way Earth rotates the way it does and how readers can find their own antipodes (spoiler alert: it's probably in an ocean!). The back endpapers feature the entire cast of animals from the book and their Latin names on what looks like graph paper, and the illustrations are done in colored pencil and ink to look a hand-drawn animal journal. 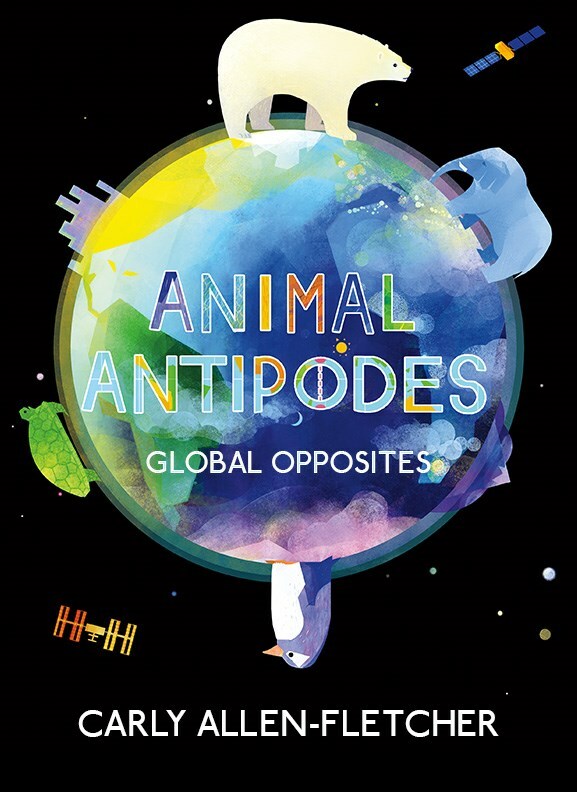 Animal Antipodes: Global Opposites publishes from Creston Books September 3, 2018!